Why Did God Let Angels Build Structures on Earth in the First Age When the Angels Were All in Spiritual Bodies and Wouldn’t Have Needed Housing? Steve, you had stated previously that the reason we have ancient structures existing today on this earth that were clearly built long before the katabole [i.e., Satan’s attempt to overthrow God’s Throne in the first age] is because the earth in the material dimension was Satan’s kingdom and the angels of God (I’m assuming us) were allowed to travel from the spiritual dimension to the material dimension. You’ve stated that’s why we have ancient structures today that can be dated much older than this flesh age. But what do you propose was God’s purpose in allowing Satan and the angels to enter the physical dimension and build structures? If, in the first earth age, we were in spiritual bodies, and the weather nor the heat of the sun would have had any effect on us, why build structures? Why would we need them? Were we just bored? LOL. That’s an interesting question. But it pre-supposes that when angels leave the spiritual realm or spiritual dimension (i.e., what you might call “the heavens”) and enter the material realm, they remain in their spiritual bodies. God and the three angels with him were clearly in physical (i.e., material bodies). Abraham even asks them if they want some water to wash the dust off their feet. And he further asks them to sit down and rest in the shade of a tree growing in his encampment. So clearly the elements (such as the dust of the earth and the heat of the sun) can have an effect on angelic beings — even on God Himself — when they’re operating in this physical dimension in their physical/material bodies. Gen 18:5 And I will fetch a morsel of bread, and comfort ye your hearts; after that ye shall pass on: for therefore are ye come to your servant. And they said, So do, as thou hast said. God and the angels even took Abraham up on his offer to feed them so their journey would not be so arduous. The phrase “comfort ye your hearts” means “refresh yourself.” In other words, God and the three angels with him agreed to sit down and take food and beverage refreshment with Abraham before resuming their fact-finding mission regarding Sodom and Gomorroh. Gen 18:6 And Abraham hastened into the tent unto Sarah, and said, Make ready quickly three measures of fine meal, knead it, and make cakes upon the hearth. Gen 18:7 And Abraham ran unto the herd, and fetcht a calf tender and good, and gave it unto a young man; and he hasted to dress it. Gen 18:8 And he took butter, and milk, and the calf which he had dressed, and set it before them; and he stood by them under the tree, and they did eat. Abraham fed God and the three angels a feast of butter, milk and meat, so they could continue their long journey to Sodom, thoroughly refreshed. So again, when angelic beings, or spiritual beings, if you prefer, come from the spiritual realm into this material realm we live in, they take on material form. They have material bodies that, yes, get dirty and require washing, and even partake of food and drink just like a human body. And they’re as affected by the elements as we are. After all, as the Scripture states, we in our flesh bodies are only “a little lower than the angels” (Psalms 8:4-6). The bottom line is that being in physical/material bodies is necessary when operating in this physical/material realm. Likewise, when an angel returns from the physical dimension to the spiritual dimension, he must shed his physical body and return in his spiritual (i.e., “air”) body. Now, there are some exceptions to the above. For example, Father can send a spirit into this material dimension for a specific reason, such as in I Kings 22:22-24, in which He sent a lying spirit to the 400 chief prophets of Israel’s notorious king Ahab in order to get them to do what He wanted them to do so Ahab would die in battle. That spirit was pretty much like a “ghost” (though I don’t like to use that terminology). The prophets of Ahab couldn’t visually see that spirit. But they were influenced by that spirit. In a sense, that spirit imitated the Holy Spirit (I Kings 22:24) and convinced the evil prophets of Baal to do what God wanted them to do, and to say what God wanted them to say. This still happens to this very day. Seducing spirits are allowed to come to this earth for specific purposes, such as to test people claiming to be God’s servants to see if they’ll fall for deception. In other words, we’re supposed to test our teachers and prophets by using our God-given discernment to tell if they’re being influenced by the Holy Spirit, or by a seducing spirit. If you study and know God’s Word well enough, you can listen to one of those TV super preachers for less than five minutes and determine whether or not he’s operating under the power of the Holy Spirit, or the power of a seducing spirit. But generally speaking, when one of God’s angels is operating in the spiritual dimension, that angel is in its spiritual “air” body. And when one of God’s angels enters into this material/physical dimension, and has a physical rather than spiritual task to perform, then that angel dons its material/physical angelic body, as in the example with Abraham entertaining God and His three angelic escorts. That’s also why the fallen angels in Genesis chapter six were able to mate with the daughters of Adam and produce those hybrid children, the giants of old. When the fallen angels left their heavenly abode and came to this earth, they had to take on physical bodies. So in turn they needed food, water, shelter (housing), etc. And in those material bodies they even partook of sexual immorality with God’s children, the daughters of Adam. I think by analogy that should answer your question. In the first age, when angels would leave the spiritual dimension (i.e., heaven) in order to enter into the material/physical dimension where the dinosaurs were, the ability to enter into the material dimension required them to don material bodies. And of course, being in the material dimension, that material body needed material housing, because when you’re in the material dimension, in a material body, you have to deal with the material elements and even material threats, i.e., the rain, heat, cold, dirt, wild animals, etc. Since God has billions of children, you can only imagine how great the cities were that had been built on this earth — in many cases, as a means of keeping the dinosaurs out. It’s only in the spiritual dimension that there are no physical elements to deal with. But here in this physical/material dimension, we have to deal with all of these things because we’re not in our “air” bodies, which is to say, our spiritual bodies. Your soul — i.e., your spiritual “air” body — is your spiritual “self.” And your soul has a spirit within it, which is your intellect. It’s what gives your soul its unique personality, if I can use that terminology. It’s what makes you who you are. So your spirit and soul constitutes the real you — the part of you that actually learns and thinks and develops a personality. But your spirit and soul have no material qualities, at least, not in the way we think of them in this material dimension, i.e.., no height, depth, breadth or length. Again, it’s much like air. It’s the part of you that lives forever (if you’re in Christ, of course). And it’s the form you’re in when you’re in the spiritual dimension with Him. Again, you can call it a “ghost” if you want. But that’s really an inadequate word. It’s really a soul with a spirit, meaning a spiritual entity with an intellect or unique personality. And in form, in that spiritual realm, it’s much like a breath of air. But once you enter into this physical/material dimension, your spiritual body (i.e., your soul and its intellect) requires a physical/material housing. We get flesh material bodies when we’re born into this material dimension through woman. But if an angel comes into this material dimension, it gets a physical (material) angelic body that looks much like our own flesh bodies, but is stronger and more powerful and has access to better technology, as well — witness the ability of the angels at Sodom and Gomorrah to instantaneously blind the perverts attempting to break into Lot’s home. My overall point being this: The material body — whether it’s a flesh body or an angelic body — is just an overcoat for the soul and its spirit, so it can get around in this physical/material dimension and accomplish physical tasks. In this material dimension, when a flesh material body dies, the spirit (which again, is like a breath of air) leaves its flesh material housing, and returns to the spiritual dimension (Ecclesiastes 12:6-7). But let’s say that spirit is later allowed to come back into this material dimension for some reason, such as on a mission for God. Then it would get a material body, which we today call an “angelic” body. As you’ve seen from the example in Genesis 18:5-8, even when God Himself enters into this material realm to perform a material task, He takes on a material body that requires food, water, shelter, shade, etc. Again, if an angel comes into this dimension, it looks pretty much just like us, materially speaking. However, they’re not made of flesh and blood. It’s a different kind of material, much more powerful than our flesh. Nevertheless, the angelic body looks so much like the human body, visually, that St. Paul at one point would write, “Be not forgetful to entertain strangers: for thereby some have entertained angels unawares” (Hebrews 13:2). In other words, sometimes an angel can be standing right next to you, as a total stranger, and you’d never know it wasn’t a flesh human being unless your discernment is above par (as Abraham’s was in the example above, as he instantly recognized the Lord) or unless that angel wanted to reveal its real identity to you. So, the basic rule-of-thumb, so to speak, is that in the spiritual dimension we have “air” bodies (i.e., spiritual bodies). And in the material dimension we have material bodies. Stick your hand out in front of you and wave it around for a moment and feel the air against it. It’s invisible. It has no height, depth, length or breadth. Yet you know it’s there. You know it’s there, because you can feel it against your skin. That, in essence, is the spiritual dimension. And when operating in that spiritual “air” dimension we have “air bodies,” meaning spiritual bodies that we move around in. But in this material/physical dimension we have material/physical bodies. And if angels cross over from the spiritual dimension into this material/physical dimension, they generally have to put on material/physical bodies, particularly when they have physical tasks to accomplish here for God. Again, there are exceptions. God can send one of His angels into this material dimension in a spiritual (air) body, if He wants to. But generally speaking, that’s only when He has a spiritual task He wants that angel to perform, such as when He sent the lying spirit to Ahab’s prophets in order to influence them to say and do what God wanted them to say and do. The bottom line is that in the first age the angels of God were allowed to come into the physical (i.e., material) realm and build great cities. They built those cities because they were in material bodies, so they needed material housing, just like we do today in our fleshly material bodies. God’s universe is vast, and its existence proves that He Himself is a builder. He builds entire universes, and we as His children build within those universes. Jer 4:23 I beheld the earth, and, lo, it was without form, and void; and the heavens, and they had no light. In the Hebrew language, God says the earth became tohu va bohu — i.e., void and without form — and so did the heavens. In other words it became a wasteland. What’s more, all light was snuffed out, both in the heavens and on earth. Again, this was at Satan’s attempted overthrow of God’s throne. God simply pulled the plug on everything. He wasn’t going to put up with such a brazen attempt against His throne. Jer 4:24 I beheld the mountains, and, lo, they trembled, and all the hills moved lightly. Jer 4:25 I beheld, and, lo, there was no man, and all the birds of the heavens were fled. The physical bodies of all men (i.e., of all of the angels who were on this earth) were destroyed. Naturally, their souls would have returned to God in heaven. Even the animals, including the birds, were all destroyed from the earth. This was not Noah’s flood. In Noah’s flood, there were people and animals saved. But at the overthrow — i.e., the katabole — all physical life on this earth was snuffed out. Jer 4:26 I beheld, and, lo, the fruitful place was a wilderness, and all the cities thereof were broken down at the presence of the LORD, and by his fierce anger. Satan had corrupted one-third of God’s children, turned them against Him (Revelation 12:4) and led them in an attempt against His throne. So God came into the physical dimension and destroyed all of their cities, which is to say, their works. We know from the ruins that He used nature to accomplish this, i.e., wind, rain, volcanic activity, earthquakes and more. And we can still see the remains or ruins of these great cities to this very day, many of which are under water, but their ruins have even been explored and photographed. Some even say the pyramids in Egypt were actually built during that first earth age, and remain to this very day because they serve as signs from the Lord of that long lost time. In fact, they are said to symbolize God’s great plan to save His children (for a fascinating insight into this idea, see the book, The Great Pyramid Decoded, by Biblical archaeologist E. Raymond Capt). Jer 4:27 For thus hath the LORD said, The whole land shall be desolate; yet will I not make a full end. In the Hebrew tongue, the word translated “desolate” means devastated to the point of astonishment. God destroyed the earth and its great cities, and every living thing. There had never been destruction like it. But as the above verse tells us, He did not “make a full end.” He left a few things for us to learn from, such as the pyramids, the great underwater ruins, the dinosaur fossils, and much more — all of that to let us know that his Word is true, and His judgment is final, i.e., if you turn against God, He’ll sooner or later turn against you once His patience runs out. Jer 4:28 For this shall the earth mourn, and the heavens above be black: because I have spoken it, I have purposed it, and will not repent, neither will I turn back from it. God did it. He destroyed all life on this earth (including the dinosaurs) and all of its great cities that had been built by the angels visiting here in material form. Even the birds were destroyed. 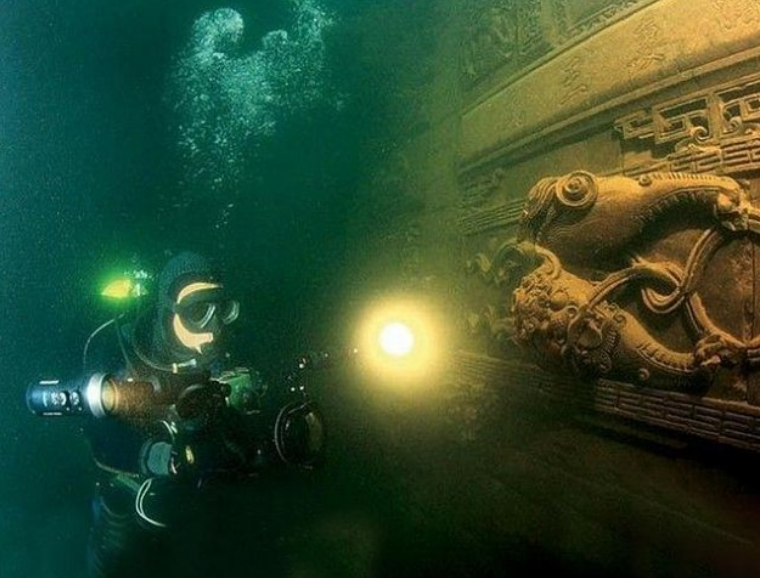 And all we have left of that era, that first age, are the remains and ruins that have been documented over the centuries, most of which are under water. You’ve heard it from people, even today. They scoff at God’s Word and continue wallowing in their evil as if this age were never going to end in judgment. But it will. This is speaking of that time described in Jeremiah 4:23-27, which we looked at above. The earth was here, much as it is today, with great land masses sticking up out of the water and some buried under water. And the heavens existed as well. If you’ll remember Jeremiah 4:23-27 above, God snuffed out all of the lights in heaven and on earth, turning the earth dark. Then He flooded the entire earth and destroyed everything on it. Again, this was not Noah’s flood. That was a complete destruction of every living thing. The earth remained. Ecclesiastes 1:4 reminds us that the earth abides forever. But nothing living on this earth was saved. 2Pe 3:7 But the heavens and the earth, which are now, by the same word are kept in store, reserved unto fire against the day of judgment and perdition of ungodly men. God is going to do it one more time. He’s going to destroy both the heavens and the earth, but this time not with water, but instead, with His cleansing fire. In other words, the heavens and earth will still be here, but they’ll be cleansed of Satan’s stench. Our heavenly Father is going to rid both heaven and earth of Satan and all of his wicked followers. And as the great book of Revelation tells us, He’s going to rejuvenate this earth, returning it to its original pristine condition (see Revelation 21:1, where the words “new” should have been translated “rejuvenated”). Just as our heavenly Father destroyed that first age and instituted this second age we now live in, so He’s going to destroy this second age and usher in the third and final age — the eternal age. And in that third and final age there will be no evil or wickedness within it, because at that time all evil and wickedness will have been done away with in the great lake of fire. If you don’t understand what I’ve written above, consider reading the Bible study, Three World Ages: Understanding God’s Creation from Beginning to End, which explains each of the three ages and their purposes, including that coming third and final age, the eternity. I hope the above information helps answer your question in more depth. There were material cities on this earth in that first age, because God’s children were in material bodies whenever they entered the material realm. They built those great cities to dwell in, i.e., for protection against the elements as well as protection against any physical threats such as predators or even the dinosaurs themselves. And those great cities and their inhabitants would still be here today if one-third of God’s children hadn’t allowed Satan to influence them to join with him in his attempted overthrow of the throne of God.